Having your phone’s USB Driver is one of the most important things you have to think about when you are going to do anything to the phone or by the phone using your computer. Whether you need to root your device, copy or move files from it, install new ROM, or whatever you are going to do, you will have to have your USB driver for PC. In today’s article, I’m going to dig into how to download and install Huawei USB Driver, so you can do whatever you want to your Huawei branded phone. First, let’s understand what’s USB Driver, and why your computer and you would need it to take some actions. When you try to connect your Huawei branded phone or any other Android operating phone to your computer for any purpose, you will be asked to download and install USB Driver. Sometimes, manufacturers of the phone provide an auto-install driver for your computer, but the other times and this is the most one, you will have to download it by yourself. If you are going to root your Huawei phone, install a custom ROM on it, take a backup, or just copy or move some of your files from a Huawei phone, and don’t know what is a USB Driver, why do you need it, or how to download Huawei USB Driver, this article is for you. There are plenty of drivers you can download for each kind of phone, and you should choose wisely the Huawei USB Driver you need to download. The factors affect on your choice are the type of your phone and your Windows edition. Whether you are using an old or new phone from Huawei, you will find the best and the suitable Huawei USB Driver for your phone. From the table below, you will find every Huawei USB Driver you might need for any type of phone and for any operating system whether you are using Windows 7, Windows 8, Windows XP, Windows Vista, or Windows 10. First: If you have an older version of Huawei USB Driver, you will have to uninstall it first to be able to install the newer version and restart your computer to complete the uninstallation. Second: Extract the downloaded .zip file, and double-click on the extracted .exe or .msi file and follow the instruction of the installation. Third: After the completing the installation, the computer will reboot, and after it boots as usual, you will be able to connect your phone easily via USB slot to do whatever you want. Note: For Huawei devices, Installing Huawei or Honor USB Driver obeys the same steps. This was the general method to download and install your Huawei USB Driver suitable for your mobile phone and your operating system. From now on, you will be able to root your device and install custom ROMs on it and more. The method of installing a USB Drive differs from a manufacturer to another just in the step of downloading the USB Drive, as some manufacturers allows you to download the .exe file directly, or downloading it as a .zip file, but they are all the same in the method of installing, using the same principle, and allowing the same functions after installing the USB Driver. Before going to root your Android smartphone, make sure having a backup of all the data stored on it whether they are photos, videos, documents, contacts, messages, or even conversations. Using Gihosoft Mobile Phone Transfer will allow you to back up your phone with easy-to-follow steps and for FREE! Moreover, you will be able to back your smartphone over macOS or Windows OS, so we assure you will be safe doing any of the available actions after downloading and installing Huawei USB Driver on your computer. 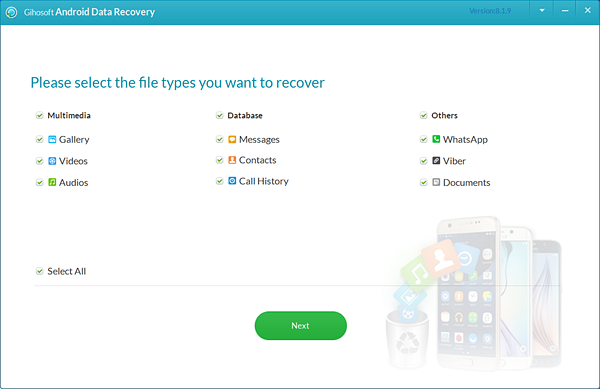 Besides, if you lost your data after rooting while having no backup, you can quickly get them back by using this Free Android Data Recovery Software.